When tightening your relay nuts, be sure to first tighten the nut below the first nut, so the contact post is tight in the plastic body. FYI, there is an O ring under the first nut and washer to maintain a water tight seal, should the box be flooded with water. Make sure all corrosion is removed from hardware and post, if present. 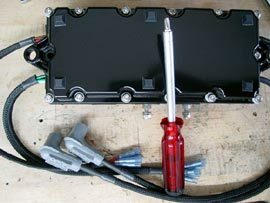 If installing a JetSki Solutions relay terminal relocation kit on a Yamaha box, turn the relay as shown. 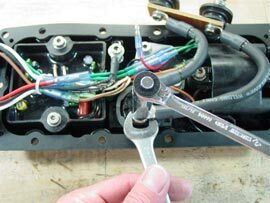 Final nut should be tightened with 1/4 drive or small open end as shown....don't use an adjustable wrench!! Use a proper, tight fitting, number 3 Phillips bit. When putting screws in holes, try to start them back in the same thread pattern instead of letting the fastener cut new threads in the cover, which will lead to stripped holes.